Sleep is something almost everyone will struggle with at one time or another in their lives. Whether you deal with it for a short period due of time to stress or have constant issues either from restlessness or medical issues, it’s something you want to find relief for immediately. Lack of sleep means a terrible immune system and no focus during the day. If you can’t sleep in any position but on your side, or deal with gerd/acid reflux, then sleeping horizontally isn’t going to work. To have an inclined position, you’ll want the MediCline Advanced Positioning Pillow. This has gone through 5 clinical trials, and is said to provide the most relief for heartburn, regurgitation, coughing, choking, nausea, and other symptoms of acid reflux/gerd. 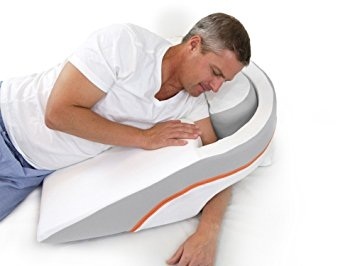 This can be used for the right or left side depending on where you put the interior pillow, and you will need a top pillow of your choice for your neck. The one thing to make sure you get right from the get-go is the size. These come in small, medium, and large, and correlate with your height to make sure you’re at the proper angle. Any you choose will cost you $219, and worry not, the plush cover is removable and can be tossed in the wash so you don’t feel the need to buy a new one every few months.